​What is your Lyme story? How do you think you contracted Lyme and how long did it take you to get a diagnosis? Both my kids had severe digestion and behavior issues the minute they were born and soon more seemingly unrelated health problems emerged. My life was a constant duct-taped stress ball trying to help them and maintain any normal parenting routine. My health had been fading for years, I had a miscarriage, two sick kids in my mid-thirties and I chalked it all up to that. Finally, I realized late one night as I couldn't sleep because the chest pain was so severe, that I had to do something about it. Dreams of lung cancer (I was an ex-smoker) or heart attack raced through my mind. I also had surgery on my esophagus in college to remove tissue webbing and it was very close to that area of my sternum. A few weeks later, we went for a family walk one afternoon and I got severe chest constriction, pain and dizziness and almost passed out. My vision got "weird" and my heart rate wasn't recovering. From ER visits, to scopes, to 6 months, losing 30 lbs and twelve doctors later that I finally received a diagnosis. The first eleven tried to give me antidepressants and blow off all the dozens of symptoms I felt. In the meantime, I had been diagnosed Sjogren's, Lupus, Hashimoto's, Glaucoma and other possible autoimmune diseases. My family doctor told me that 3 weeks of doxycycline would fix it. It nearly took my life. I spent way too many nights racking my brain for my ground zero. I had no bulls-eye rash, I had no discernible tick bite. I spent my childhood in the woods of Missouri camping and running around barefoot. I spent my college years traveling to Europe and to the Caribbean. Who knows. I finally realized it didn't matter where I got it. I had it. I had Lyme and nearly a dozen of its evil friends. Did they come together or accumulate over the years? Who knows. Since my kids had every single critter I had, it goes back at least 12 years or more. I let it go, no more thoughts of its origin, only its exit. In my previous life, I was a marketing and communications executive and then a work-from-home and stay-at-home mom. I have now become a PhD in health, healing, living right, and all things Lyme. My passion is to see people embrace God's love and faithfulness by providing hope for their journey to healing. I love talking about health and healing to anyone who will listen. I adore my kids and how God has used our hardships to grow them into amazing young people with character and perseverance. In 2014, I released that story called My God, My Lyme and the website and blog Just Living After Lyme and Chronic Illness. The website is a place to come for all those who are just "trying to live" despite their circumstances of chronic illness. Also, on Facebook. In my previous life before kids, I was a communications and marketing professional who was known for taking charge and being independent. Then after having kids, my immediate job was not just mom, but health advocate mom. I had to become an expert on all things healthy and had to do it all in uncharted territory before Whole Foods Market was mainstream. Then Lyme hit for me and we had a name for what had been plaguing the kids for years. So now, I'm an expert at cooking from scratch, gluten-free, organic and healthy. My talent is recovering my kids health and helping my family become fully functional and live again. Oh, and being a fierce momma bear. My passion has become helping others heal and sharing hope. Fighting Lyme disease, we all know is uncharted territory with new treatments and information coming out all the time. I don't want anyone else to have to suffer with no answers. Even more than that, though, I don't want anyone fighting this terrible illness without hope. My belief in God and his faithfulness gave me hope. That hope was the only anchor I could hold onto to get up each day and continue to fight. Battling Lyme's darkest days, months and years require hope with a capital H. The battle was God’s not mine alone. He gave me the strength and he healed. Before I had CCSVI surgery on my jugular veins, my lyme treatment was touch and go. The amount of intense pain I had against my heart and in my cranium was unbearable. Add that to my other varied symptoms and I just never slept and spent many nights thinking morning would never come or that my kids would find me dead in bed when they woke up. It was in those dark long nights that God spoke to me, comforted me and gave me hope. There have been many moments, nights and weeks I which I felt impending darkness over issues with my kids also. I claimed the promises of God. I asked for strength. I asked for wisdom and guidance. I asked for provision. His answers were not always what I envisioned, but he answered each one. When I couldn't pray I asked others to. When I had no strength left I played praise music. When I thought hope was lost, God actually said, "While you're awake, let's pray for others," and so I did. One small step at a time, one day at a time with my head down and focused on Jesus and getting well. The overarching best advice I could give is that physically, emotionally and spiritually healing must happen simultaneously. There is no true lasting physical restoration without the other two. They are dependent upon each other. In fact, the physical body has likely gotten weak over years of emotional strain and stress. Fix the root of the problem and the body will follow. Specifically, I completely believe and give credit to the Hansa Center for Optimum Health for their natural methodologies for treating Lyme disease. Their methods are safe for those who can't tolerate antibiotics and safe for kids. They treat all three aspects of the person to help manifest complete restoration. Thirdly, altering your lifestyle would be important. Reducing stress, changing diet, exercise, positive relationships, and or shifting careers all become fair game. Nothing is off the table if you want to get well and stay well. The new normal looks different for everyone, but for successful recoveries, life is completely different on the other side in a good way. Lyme disease exists in hundreds of forms and its symptoms vary depending on each person afflicted. There are dozens of autoimmune disorders and other diseases misdiagnosed each and every day in the traditional allopathic world of medicine, which are really Lyme. It is the great imitator. Modern day doctors are not educated in Lyme disease and are actually swimming upstream against their patients who have it and are trying to get a diagnosis. The CDC is not our friend and with their falsehoods, the insurance industry will not come on board to acknowledge chronic Lyme or its varied treatments. If you think you have Lyme, you have to get educated and be your own advocate. You have to personally fund your own healing treatment to the tune of $50,000 per year and up. It is faster growing that AIDS, it attacks more people each year than heart disease and breast cancer, yet no one is talking about it enough. It can be defeated though. It will not win. Doctors who listened and weren't afraid to try anything. My army of friends and family who kept praying and kept my family afloat. My warrior mommy friends that help me walk this walk on the hard days. My husband who never gave up and never left. My kids for have the tenacity and courage to fight for healing. Facebook groups and the Internet for a stream of knowledge, especially Scott Forsgren the BetterHealthGuy! Ultimately, God's faithfulness is the thing I am the most grateful for. He held me up and I survived because he provided in a hundred big ways and a million small ones. 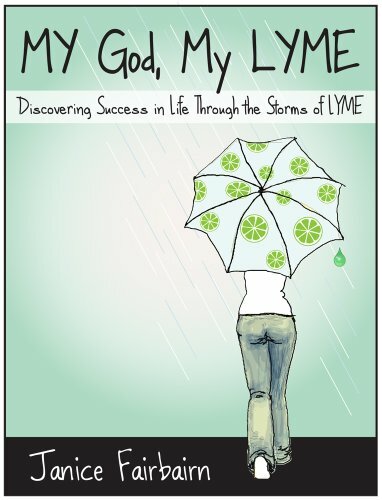 Tell us about a person who inspires you in the Lyme community? That is too difficult to name just one. I already mentioned how much I admire and rely on Scott Forsgren for his willingness to dedicate his life to spread Lyme knowledge and awareness. Recently, I have the utmost respect for Yolanda Foster and John Cauldwell for their public vulnerability and commitment to raising awareness and making a difference. Amy B. Scher's books and work are also adding fantastic things to the Lyme community. My heart though, is in the patients and doctors at the Hansa clinic. Dr. Jernigan has pioneered an amazing anointed facility that changes lives all day long. His team of doctors are groundbreaking, hard working and open minded to anything cutting edge that gets success. They are relentless. My favorite people are the Lyme warriors I meet; the hearts and faith and hope of the people holding on to a thread for themselves or their kids to beat this beast. My husband and I now own a long term stay house in Wichita just for Lyme patients that come from all over the country and world to get treatment at Hansa. We get the pleasure to meet and serve this vast array of Lyme warriors that still love, laugh and find hope in the darkest places. They bless me immensely. Never give up, there is hope. God will never leave or forsake you. I'm not exactly sure when I became infected with Lyme disease, but what I do know is chronic stress brought it out of remission. My chosen profession is social work. I thrive on helping people find the best in themselves and sitting with them in their darkest moments, but it doesn't come without a cost. That cost is frequent flares and strange manifestations of Lyme and co-infections. As much as I desire a mindful lifestyle, sometimes it doesn't always seem to jibe with my job and other responsibilities. At the end of the day, I know whatever I was stressed out about wasn't worth it compromising my health. In the United States we reward hard work, not balance. The person who stays at work until 7 o'clock at night and then sits behind a laptop until they go to sleep gets the raise or promotion, not the person who leaves work at work to spend time with family or to hit up an evening yoga class. The latter is actually harder and better work. The reward is long-term health and sanity. Part of the reason illness shows up in our lives is to tell us to slow down and reevaluate. Let's be more aware of the stress we are allowing into our bodies and do some good old fashioned self-care. And, most importantly, don't get stressed about being stressed. It's a part of life, especially when you have a chronic illness. That's where forgiveness and self-compassion come in. We're all in this together. I have an active imagination, and have to talk myself down multiple times a day, but I'm getting better at putting things in perspective and practicing gratitude. When it's all said and done, there are very few things that truly matter. That Don't Sweat The Small Stuff guy had a point. When I meditate, it can change my mood or pain level in as little as 5 minutes. It is truly as good as everyone says it is. I started with one minute and worked my way up to 5. Taking an hour to stretch, strengthen, and be present is essential, but it's not always easy to fit into a busy schedule, especially when you add on debilitating fatigue, but once or twice a week is enough to make a difference. There are few things that I find more cathartic than writing. Writing can take many forms—a lighthearted Twitter feed, a private journal, songwriting, etc. The point is to get what is in your head down on paper, or screen, or whatever. The farther I get from the stress of daily living, the more I am able to be in the present moment and enjoy all that life has to offer. But it's not always possible or affordable. That's why I love travel planning. I plan trips I may never take. I create Pinterest boards of travel photos and far off places I want to visit one day. Travel planning makes me feel calm and excited at the same time. Is there a better feeling than that? What are your stress relievers? How can you practice more self-care in your life? "You will find that it is necessary to let things go; simply for the reason that they are heavy." - C. Joybell C.